I’m a dad of two boys, ages six and eight. Both have been in tennis lessons for a while. As you would expect, they’ve outgrown their racquets multiple times. So to make sure I was getting the best value for my money, I wanted to know What Are The Best Tennis Racquets for Juniors? So, I did a little research, talked to my son’s coaches, and even consulted with a few Pro Shop Managers and got some answers. To my surprise, the inexpensive options I was researching, were actually the best option! So, what is the best tennis racquet for a junior player? Well, in my opinion, it’s the Wilson US Open Junior Tennis Racquet. It’s what we recently decided to purchase for my eight year old when he needed an upgrade. It comes in all the appropriate lengths for youngsters and color schemes for both boys or girls. And the best part? It’s typically under $40! What if you can’t find the right size or color on Amazon? What if you want to try Junior Racquets from companies like HEAD, Prince or Babolat? I’m going to let you in on a little tennis industry secret...when it comes to junior racquets, it doesn’t matter!! Yep...I said it. Keep reading to find out more. 19", 21", 23", or 25" lengths. Great for all kids learning the game and taking lessons for the first time. Comes in 25" or 26" lengths for ages 8-11. Open string pattern for more power. Lightweight graphite so it feels and plays more like an adult racquet. Comes in lengths 23", 25", and 26"
Made from a hybrid carbon composite material "Innegra" for performance and durability. Perfect "Goldilocks" racquet for kids ahead of beginners but not yet advanced. 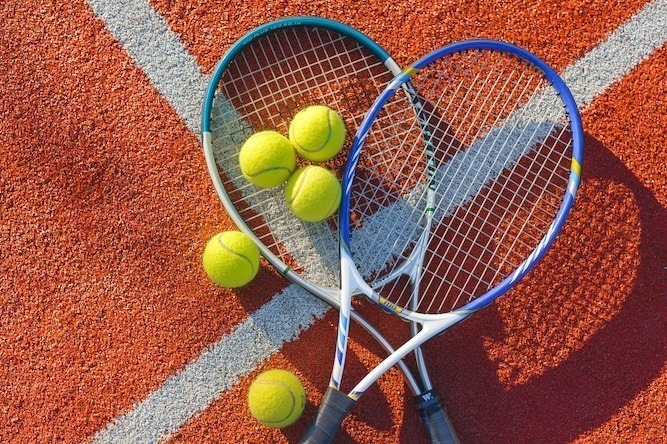 What is a Junior Tennis Racquet? What is a junior tennis racquet? A junior tennis racquet is one built and sized properly for kids. This means the length of the frame and the head size of the racquet are all sized perfectly for a child’s hand. It’s not a small adult racquet - they are racquets built for kids and only kids. They most important part here is the word “sized” The length of the frame is what is going to let you know it’s a junior tennis racquet. Adult racquets have a length of 27 to 27.5 inches. Junior tennis racquets have a wide range of sizes based on your child’s age. They start at a length of 19," that’s the smallest size for a junior racquet. And they go all the way up to a 26". Technically, there are racquets smaller than a 19". You can find racquets sized at 17" but those are Toddler racquets. They are completely different then junior racquets. To avoid confusion, look at it this way: If you’ve got a preschooler - think toddler racquet. If your kiddos are in grade school, I’d consider an official junior sized tennis racquet. What Size Is a Junior Tennis Racquet? So, let’s take a closer look at the sizes of junior tennis racquets. Like I said, they range in racquet lengths. From small to big they are: 19, 21, 23, 25, and 26. Again, this number refers to the overall length of the racquet, and it’s in inches. As your child grows, they’re going to move up in length. For instance, my 8 year old had a 23” racquet we bought when he was 7. My 6 year old was playing with a 19” because he was 5 years old when we bought it. It was clear, they were playing with racquets that were too small! My 6 year old was struggling to make contact with the ball when he played with the tiny 19”, it was too short!! Mid practice session, their instructor gave my youngest son the 23” and gave my oldest a 25” from their demo pile. Now tennis was a lot more fun for them! Lesson learned. As you have guessed, the lengths are going to roughly correlate to your child’s age. Generally speaking, 5 year olds are going to use a 19” junior racquet. Ages 5-8 are going to are going to need a 21” or 23” racquet depending on how big your child is for their age. And 9-10 year olds are going to want a 25” racquet or maybe even a 26” racquet. If your child is 10+, really interested in tennis, and not small for their age - I’d strongly recommend looking at a 26” racquet. Remember, adult racquets start at 27” so the 26” racquet is sort of a tweener racquet between a pure junior racquet and an adult option. It’s a great transition racquet as they move from a kids size to an adult size racquet. There are other racquet measurements like head size but, with junior tennis racquets, you really don’t have to worry about all that. How Do I Choose the Best Tennis Racquet For A Junior? Choosing the best junior tennis racquet for your kid really comes down to two things: choosing the right brand, and how to select the right size for your particular child. Once you have those two questions answered, you’re good to go. How Do I Choose The Best Brand Of Junior Tennis Racquet? This question is really quite simple, but it comes down to how experienced your child is and how much he or she enjoys tennis. 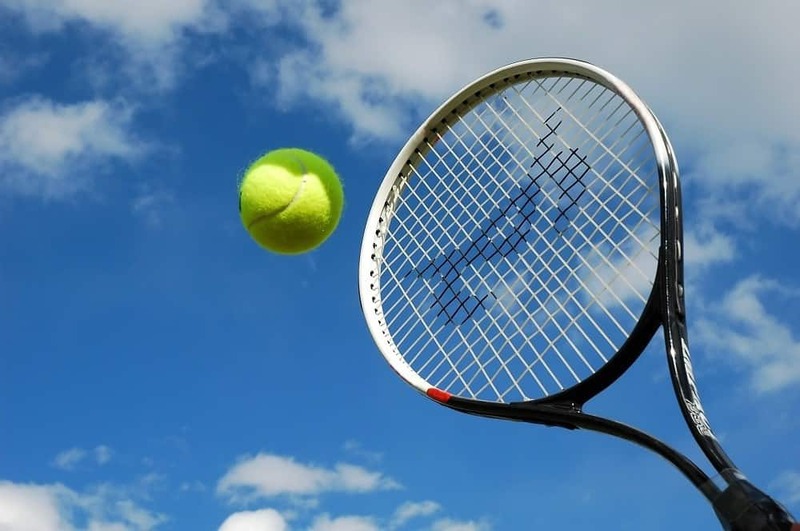 Junior tennis racquets are either made from a basic, standard construction aluminum based frame or a more advanced frame made from either carbon fiber or graphite composite material. If you’re choosing between a 19” to 25” racquet and your child is still just learning tennis, choose any aluminum racquet from any major brand and you’ll be good to go. If your child is really into tennis, loves to play it and has improved rapidly through their tennis lessons, I'd recommend a slightly more advanced racquet from brands like Wilson, HEAD or Babolat. Any 19" to 25" racquet for brand new players will work perfect. If you're child is 8 years or older and loving tennis - go with a better performing 25" or 26" graphite racquet. 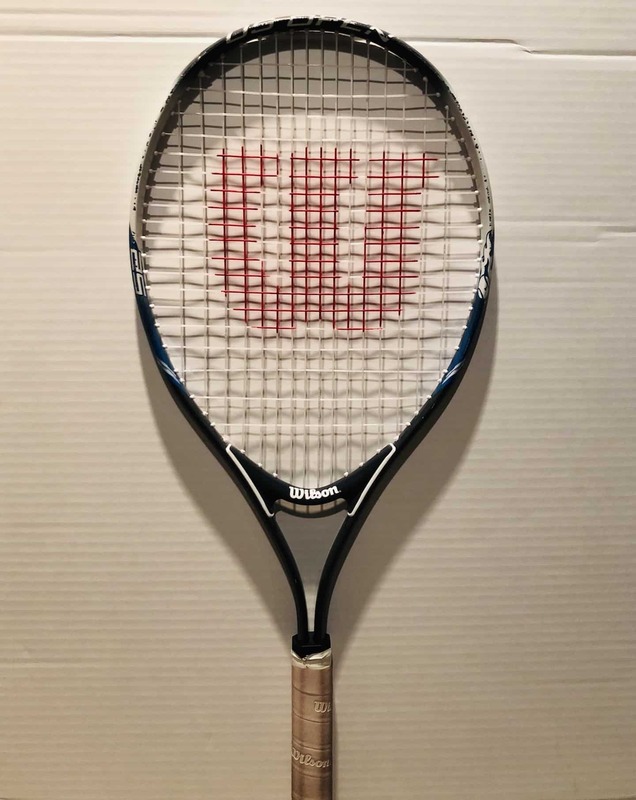 I chose the Wilson US Open Junior Racquet because it was recommended by the manager at the pro shop where my kids take tennis lessons. It's a great inexpensive aluminum racquet perfect for my son who's still learning the game. Other good aluminum racquet options to try would be the Wilson Burn Junior Racquet, the HEAD Speed Junior, and the Babolat Nadal Junior Racquet. Keep in mind, the options above are aluminum racquets. That means the frame is made out of basic aluminum. There is no fancy racquet technology here, and there doesn’t need to be. If your child is still learning the fundamentals of tennis and just likes going to tennis practice, choose any aluminum racquet from any brand and you’ll be good. I learned this directly from the pro shop manager at my local tennis facility. You’ll find more expensive racquets made of lightweight graphite in the 25” and 26” lengths. But, I’d caution jumping right to those unless your child is really committed to tennis. If they absolutely love tennis, and have outgrown their 23 inch racquet I’d recommend the Wilson Pro Staff 25 or 26 or the Babolat Pure Areo Junior 25 or 26. These racquets are geared towards better junior performance because of their lightweight frame and open string pattern. Most adult racquets these days are made from state of the art carbon fiber material, so I began to look for junior tennis racquets made from carbon fiber. What I found was a new line of junior tennis racquets from HEAD - their IG Speed series, made from a hybrid carbon fiber called "Innegra". HEAD claims its an advanced carbon composite technology. After doing a little more research, I found out that this line of racquets from HEAD are a great "tweener" racquet. If your child is beyond a basic aluminum racquet but not advanced or old enough to handle a graphite 25" or 26" racquet - then the HEAD IG Speed Junior Series may be perfect for them! It comes in perfectly balanced sizes of 23", 25" and 26". Related: Have a high schooler interested in making the tennis team? Check out our helpful racquet guide for high schoolers! How Do I Select The Best Junior Tennis Racquet Size? Finding and selecting the right sized racquet really comes down to your child’s age and their height. Age is the first specification to look at though. 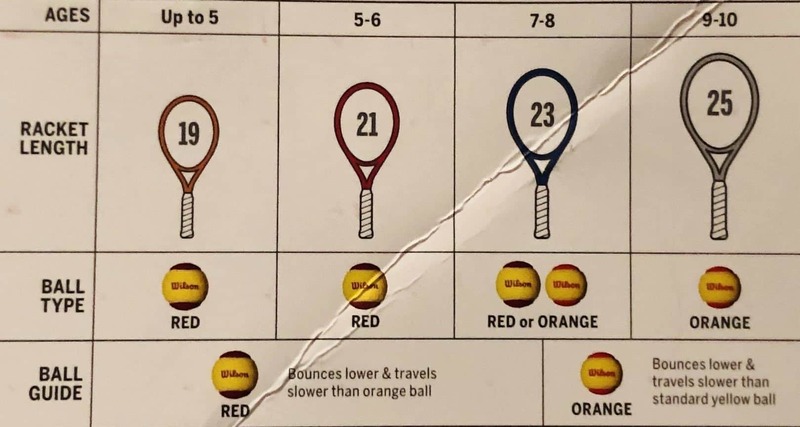 I pulled the image below directly from the Wilson racquet I bought for my 8 year old. Keep in mind, those are loose guidelines. That’s where height comes into play. Wilson says 5-6 year olds should be playing with a 21” racquet but my 6 year old plays with a 23” because of his height. So, these are not strict guidelines. Another way to measure proper junior racquet height and length is to have your child hold the racquet with a standard grip and bring the racquet head down to the floor. The head of the racquet should be barely off the floor. If the end of the racquet is more than an inch off the ground, it’s too small (aka too short). If the racquet head is clearing touching the ground and dragging as they walk, it’s too big (aka too long). When it comes to grip, you’ll only have to start worrying about proper grip when you’ve entered adult racquet sizes. Generally speaking the best tennis racquets for juniors are going to come in grip lengths somewhere around 3 ⅞ and 4”. Those are standard, almost universal junior grips that work well for any small hands 99% of the time. The Wilson US Open Junior Tennis Racquet is a sturdy lightweight youth racquet made from an aluminum frame. It’s not as light as the more expensive graphite or composite racquets in it’s class but it’s a VERY dependable junior racquet! What I love about this racquet is that it comes in all the common junior sizes: 19”, 21”, 23” and 25”. My eight year old has enjoyed playing with the 25” frame and it has been a great update from his Wilson Burn 23” he was playing with. I would say the 25” frame is going to suite 8 to 9 year olds really well and maybe some bigger 7 year olds. My son didn’t complain once about the racquet feeling too heavy, too long, or hard to hold. It’s been a great racquet for a junior to just pick up and play with as they learn tennis. Who is it for? If your child is still learning the game of tennis, is taking lessons and is showing some interest, this will be a great racquet! This racquet is designed for the everyday youngster still getting a feel for swinging and hitting the ball on the fly. It’s got a standard string pattern so it’s not tailored towards power or spin. Just perfectly made for the fundamentals as your child learns the game of tennis. It’s got exactly what your child needs to learn the basics without any of the pricey bells and whistles they’re not ready for yet. And best of all, it’s very affordable. The Wilson Pro Staff Junior 26 is technically a “Junior Performance Racquet”, so it’s ideal for kids that take their tennis a little more seriously. It comes in a lightweight graphite 25” or 26” frame depending on your child’s height and age. If your son or daughter is 8 to 9 years of age, I’d go with the 25”. If they’re 10 or older, choose the 26” frame. It’s a “performance junior racquet” because it is based off of the adult racquet that Roger Federer plays with, the Pro Staff RF97, so it’s built for superior performance compared to the standard junior racquets made from aluminum. It’s essentially the pint size version of Federer’s racquet, so you know it’s the real deal. Despite being a kids racquet, it allows for better performance because of it’s open 16 by 18 string pattern. This allows the youngster to put more power behind their swings and even add some spin depending on their skill level. The frame is slightly bigger and thicker, so that adds to power aspect as well. It also makes it a little more durable too - we all know youngsters are prone to dropping their racquet. If your child is advancing from the red dot tennis balls to green dot tennis balls, this a great racquet as they climb the ranks in junior tennis. The HEAD IG Speed series is a wonderful racquet for kids ages six to eleven because it comes it three sizes: 23", 25" and 26". It's going to offer your youngster a lightweight feel thanks to it's unique, exclusive "Innegra" carbon fiber frame. It's also primed and ready for more power and topspin action because of its open string pattern. This is a relatively new racquet on the market but, after doing a little research I realized that this racquet is clearly targeting a specific kind of junior player. As I've said, any $30 aluminum based racquet is great for first timers. Graphite racquets are for older 9 to 11 year olds who are really developing their tennis skills. The IG Speed from HEAD is a racquet designed to sit comfortably in between those two player types. So does that make this a niche junior racquet in a way? No. It's typically under $50, which a fantastic value! That's only about twenty dollars more than your standard aluminum racquet but, you also get a lot of the performance you'd expect from a bigger, more expensive ($100) graphite option. You just won't find another racquet at this price point offering this much performance. Could your child, who's never played tennis before use this racquet? Absolutely! In fact, the 23" frame is a really good choice for kids just starting out who are between the ages of five to seven. And, as your child develops, this racquet will help them grow and it'll grow with them so you won't have to worry about upgrading their racquet as quickly. It's worth noting that the Junior IG Speed series of racquets were the only carbon fiber kids tennis racquet I found on the market. Kudos to HEAD for taking a little risk, making a performance oriented, lightweight carbon fiber racquet for kids, and pricing it just above all the standard aluminum racquets. In conclusion, it really comes down to how excited and into tennis your child is. If you are just starting out with tennis lessons and your child is learning the basics, choosing the best junior tennis racquet is easy. Follow the sizing chart to make sure you’ve got the proper length, and select any cool design your son or daughter likes. At this stage in their development, choosing any aluminum racquet under $50 from reputable manufacturers like Wilson, HEAD or Babolat is going to work just fine. If your little one loves to play tennis and you’ve been doing tennis lessons for a while, you can upgrade to a $50 or $100 racquet and get an advanced junior tennis racquet made from carbon fiber or graphite to add to his or her development. Let us know what racquet you’ve chosen for your child or grandchild and give us your thoughts!